10 Pieces not including wooden box, pencils, wood triangles. This compass is in great working condition. Compass has clear glass and clean fluid. Has bubble in fluid. See photos. Stainless housing. The most common process of this is to sight the sun at noon to find the latitude of one’s location. 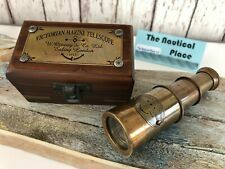 BRASS SEXTANT. SEXTANT WEIGHT:3. WOODEN BOX SIZE MATERIAL : SOLID BRASS. Glass optics for a clear view (not plastic lenses). 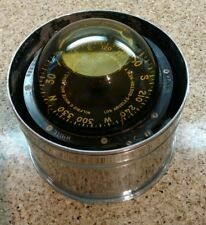 VINTAGE 15" MARINE NAUTICAL metal alloy boat SHIP rectangle PORTHOLE w GLASS . Approx 15 x8". Paint chipping in spots. 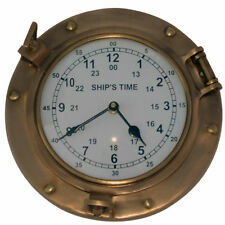 • Wonderful Nautical or Pirate Collector Piece. Product Features • Made of Brass. Discover Card . We will send the proper invoice and make the accommodations. Red Sky Categories. • About 9" in Length When Fully Extended. Nautical Teak Wood Boat Ships Wheel Solid Brass Hub 30". This large wooden Ship Steering Wheel is made of solid teak wood with solid brass handles and solid brass center hub that has a hole. The Ships Steering Wheel measures 30" in diameter from handle end to handle end. There is not a better way to enhance your nautical marine decor than with a rugged wooden ship steering wheel inside or outside (this teak ships wheel can weather the elements). The perfect nautical gift to complement your recipent's marine furniture decor! Size: 30 inches in diameter, Spokes: 6, Material: Solid teak wood, Solid Brass Handles. 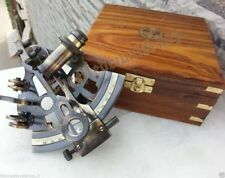 (USED COMPLETE GOOD WORKING CONDITION) EARLY BRASS COMPASS, STAMPED--MARBLE ARMS & MFG. The replica spyglass is made of high quality solid brass. The finish is antiqued distressed brass to give it an authentic nautical antique look, blemishes & imperfections are expected. The end pieces are covered in antiqued distressed leather. It is a long, tedious process. 1500 ft long and 50 ft wide. Netting can be cut and will not unravel. Authentic Used Fishing Net. here to check out our full line of Authentic Used Fish Nets! We try to cut around all of the cuts & tears but occasionally one will slip through. They have red & green fresnel lenses. "Port" & "Starboard" Lanterns. Each lantern weighs a little under 1.5 lbs. Material: Iron with antique copper finish. Uses regular lamp oil. Excellent Clear Condition No Reserve! Each item is made of best quality material, and is inspected before. Best for Gifting Purpose. See last photo for size comparison. Approx 20”. You will get one of the buoys listed. If you would like a specific one please message me immediately after purchase. Please message me if you would like a bulk purchase 2 or more and can do a discounted price. Maine Lobster Buoy Wooden Hand Painted Rare Nautical Ocean Lake Decor. Shipped with USPS Priority Mail. Finish : Antique Brass. Primary Material : Brass. 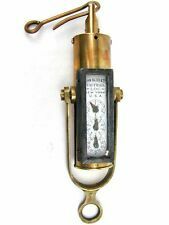 New ListingAntique Steampunk Brass Pocket Maritime Compass from FRANCE - GORGEOUS, L@@K! This is a rare find from an antique estate collection. This large wooden ship steering wheel is made of solid teak wood with a brass center hub that has an approx. 1" diameter hole. The ships steering wheel measures 36" in diameter from handle end to handle end. There is not a better way to enhance your nautical marine decor than with a rugged wooden ship steering wheel inside or outside (this teak ships wheel can weather the elements). The perfect nautical gift to complement your recipient's nautical wall decor! Size: 36 inches in diameter, Weight: approx. 11.9 lbs, Spokes: 8, Material: Solid teak wood, Finish: Natural wood, Note: Shipped with handles unscrewed to save on shipping, you just need to twist them on, Made in India. NO. 23-2 9 1/2 ROUND. WAYNESBORO, VA.
SEXTANT WEIGHT:390 gm (without box). Primarily. Glass optics for a clear view (not plastic lenses). MATERIAL: SOLID BRASS/WOODEN BOX. All 3 lenses (red-green-clear) are intact with no cracks. I cannot get the bottom to twist/latch properly due to the compression on the base. t otherwise appears to be complete. It is either a candidate for restoration or simply for display. Why pay top dollar when you can have the best for less? Handmade wooden aircraft carrier 23" long 9" wide Non smoking, pet free home. Please look at the photos closely as they are part of the description and the item pictured is what you are buying. Payment expected within 3 days. Let me know if you have any questions. I do not do returns. If you for any reason there is an issue or feel the item is not as described please contact me before opening a case with eBay. Just send me a message. Happy bidding! Color : Antique Brass. Material Used : Brass. These will have original netting on them. In Japan, glass fishing floats are being replaced by plastic and polystyrene making authentic glass fishing floats highly collectible. These floats are from my own personal collection which I have collected over the past 30 years. Japanese Glass Fishing FLOATS 3-3.5" Netted LOT-9 Net Buoy Authentic Vintage! Glass Blown Floats. In Rope Netting. Variable net color, fiber, thickness. Many with Tiny Bubbles in Glass. Authentic Marine Salvage. Note: This is not a Dalvey compass, it is a similar style. ♥ This beautiful brass pocket compass will make a great gift. This can be attached to a necklace or just keep it in your pocket for your next hiking or camping trip. (3) 2" Netted Glass Floats. The wooden buoys predate glass floats. They are referred to by Japanese float expert, Walt Pich, as "ancient". Antique wooden deep-sea fishing floats may show, splits, and roughness from life in the ocean. 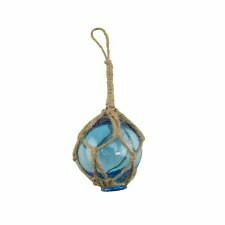 TRIO COLOR GLASS FLOAT BALL WITH FISHING NET. Nice net for hanging by window or outside. REPRODUCTION NAUTICAL. It is 18" length from top to bottom. NO. 23-2 9 1/2 ROUND. BIRD IS GOLD AND BLACK. No glass or fasteners to lock it. No seal,small paint marks,otherwise looks nice. Shipping to confirmed addresses only in the 48 states. Genuine Antique Ship Wheel Helm Brass And Wood 17”. Just needs to be polished! Nice wheel! It was hand blown into a two piece mold & has a glass plug inserted in the bottom of the float. The color of the float is dependent on the color of the glass bottles the were ground up to make the float. Brass Sundial Compass. 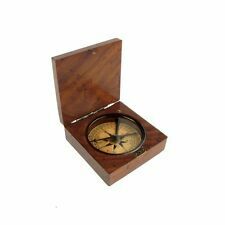 This beautiful antique finish brass sundial compass is fully functional and will make a great gift or be perfect for your next hiking or camping trip. I have attached a heavy jump ring to attach the compass to a chain (chain not included). MATERIAL : BRASS. Made of Brass & Glass-Tube with. 180 kg weight. FINISH: Antique. Brass Compass w/ Lid. 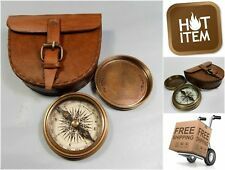 This beautiful brass pocket compass will make a great gift or be perfect for your next hiking or camping trip. I have attached a heavy jump ring to attach the compass to a chain. The scope extends to a full 6\" and can retract to fit into its own ornate box. Beautiful Brass Finish. Color: Brass. Keep it safe in its own box. This beautiful Sundial Compass has Beautiful Finish. Material: Brass. Finish: Shiny Brass Finish. Push button operation to open the cover. It is a great size for your pocket. A very small Fresnel lens, or at least that is what I believe it is. This is one outstanding clock. You will be proud to display this clock in your collection. Don't miss out on this great collector's clock! The brass case and bell are are looking very good. This is a Reproduction Item, Not Sold As Antique. 18" FULL SIZE DELUXE MODEL REPLICA. It is a long, tedious process. 1500 ft long and 50 ft wide. Netting can be cut and will not unravel. Authentic Used Fishing Net. We try to cut around all of the cuts & tears but occasionally one will slip through. In Japan, glass fishing floats are being replaced by plastic and polystyrene making authentic glass fishing floats highly collectible. These floats are from my own personal collection which I have collected over the past 30 years. Weight: 800 gm. Material: Brass & Glass. How Can You Start Collecting Model Ships And Maritime Memorabilia? First, determine the scope of the collection by focusing on equipment from ships, such as clocks, compasses, harpoons, wheels, and anchors, or settle on specific types of vessels, such as racing yachts, World War II vessels, or vintage Seifert boats. After choosing a theme, familiarize yourself with the various design elements of authentic pieces so that you know what to look for. Set a budget for yourself so that you do not spend everything on a single piece, allowing your collection to grow over time. Pay close attention to the condition of the pieces you have your eye on, both for value and for display purposes. What Should You Look For When Evaluating A Model Ship? Take note of the vessel's overall appearance to see if it accurately represents the life-size ship, and note any indicators of poor condition or design flaws. Study the hull construction and its symmetry, as well as the materials and accessories the model ship features. Take a close look at the paintwork or the finishes and stains, and then study the fabrication of the ship's metal fittings to determine the design's integrity. You should also evaluate the ship's rigging to ensure that all of the parts and pieces are placed in an authentic manner with appropriate knots. 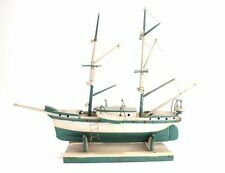 How Can You Determine The Value Of An Antique Model Ship? Ensure that the ship has a solid hull and that all of the details are correct for that specific model. Make sure that it has the proper common hardware for a model ship of its time, and, if possible, have a professional appraise it. Compare your findings to research materials and other reference guides to adequately gauge the value of the ship.